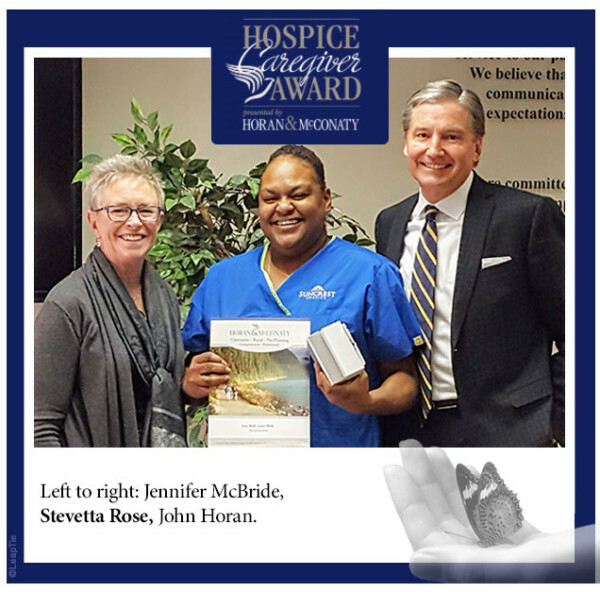 Stevetta Rose from Suncrest Hospice is the winner of the Hospice Caregiver Award presented by Horan & McConaty. Stevetta was nominated by Rosann Bryant and Jerry Mihlbachler. Stevetta Rose had such a beautiful smile and a warm approach for our mom every day. Often helping two people at a time during meals, she was so patient and willing to work with whatever mood, ability or needs presented from day to day. She was just so sweet and tuned in and found a way every day to touch Mom’s heart and her inner soul while taking care of her physical self.